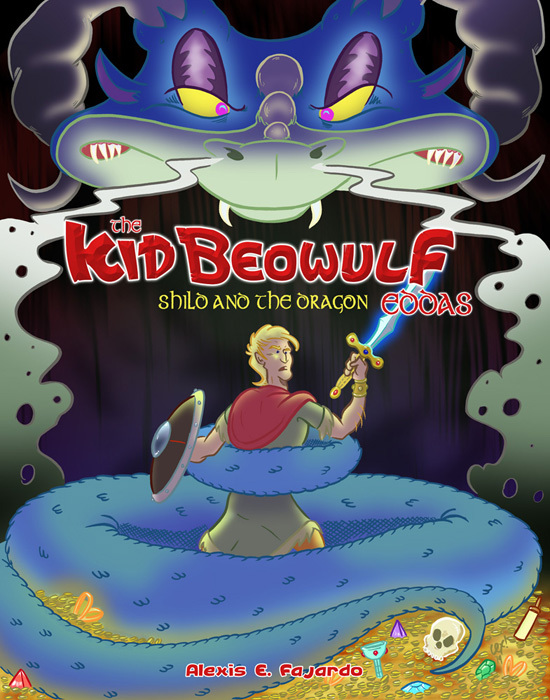 I’m happy to announce a new story Kid Beowulf Eddas: Shild and the Dragon, debuts digitally today on Comixology, Comics+, Amazon Kindle, and in good ol’ comic book form at Amazon & Createspace! I’ve been working on this story for a while (previous posts can be read here and here) and I’m pleased with how the story turned out. Shild and the Dragon is the first story in a new series I’m working on called The Kid Beowulf Eddas – these are short stories that focus on some of the secondary characters from the KidB. Universe. I have several goals I want to hit with these stories and I think Shild is a good start. Some of the goals include tighter and more focused storytelling: I have a tendency to get verbose (after all, my average book is over 200 pages), so I wanted to do short stories that focused on two-to-three characters. Another goal was to build out the KidB. universe and play with back stories that fell through the cracks in the graphic novels. Shild and the Dragon, for instance, is the story of how Hrothgar’s dad lost his hand and the Dragon lost his eye (which had a passing mention in pages 35-38 of Blood-Bound Oath). The third goal was doing the comic in full color, which I did with flatting help from Jose Flores and cover help from Brian Kolm. Overall, I really like the final package and hope you will too. Here’s a sneak peak at the first four pages. Hit the links above to get it for your tablets or you can order a copy right here.